I’m almost certain they arrived in my garden as tag-alongs with plants given to me by fellow gardeners many years ago. When I asked my co-workers about them, they told me they were Labrador (also known as alpine) violets. Most likely they aren’t. Looking at photos of the flowers, they appear to be purple-leaved form of the European dog-violet (Viola riviniana ‘Purpurea Group’), which is often sold by as Viola labradorica. For years, these violets contained themselves to their original pots. All it took were a few of their explosive seeds and BAM! 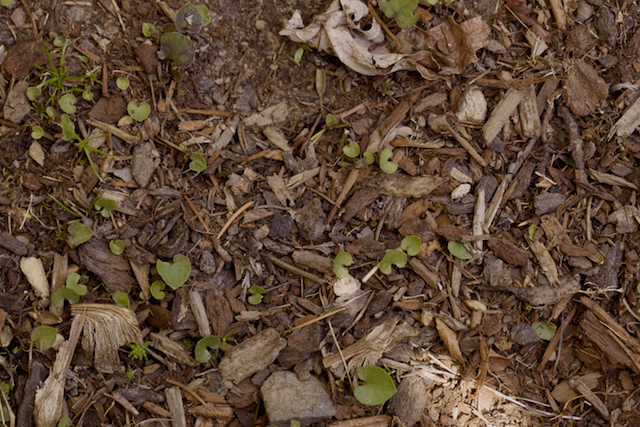 When the first few weedy violets showed up in the garden, I welcomed them thinking they were actually quite pretty and “maybe they could be a nice ground cover?” or “at least they’re better than bark mulch?” Other gardeners think so. Yes, they are quite lovely in May, when my other plants are just starting to awaken. The heart-shaped leaves with bits of purple are cute. But these prolific self-seeders clearly had their eyes set on overtaking many of my slower growing plants. I’m experienced with weeds and foresaw the eventual take-over of these unless I succeeded in a systemic eradication. Nearly every day, for at least 10-15 minutes, sometimes longer, I’m out there squatting in the yard yanking these guys at the base. Fingers alone aren’t strong enough to budge some of the older stems. No longer dainty, these old-timers are approaching half an inch thick. I can now distinguish by feel the grubby gnarled violet stems from the smooth stems of the plants I do want. It’s a long process of teasing two ground covers apart. I’ve found I need to be diligent. It is impossible for me to be out weeding Labrador violets too often. They hide beneath other plants; I have to look from different perspectives and angles to find them all. And they continue to germinate. For example, I was out of town over the weekend and a whole mass of seedlings appeared. The good news is that I think I’m now on the winning side. The Mother plants whose roots and stems are tougher than my hands are becoming weakened every time I pull their roots out or even just parts of them off; the baby plants are quickly weeded out. So beware! if you see this cute little violet in your yard, think twice before letting it gain a foothold.